contact the best website to do assignments. 24 hours homework help. Contact our online assignment experts for help with writing your homework on any subject. We are available 24x7. Chat with us on our website for immediate asistance. It is easy to get in touch with us. We are available 24x7 online on chat & email only. We have made a few changes to the way our customers can contact us in order to facilitate better communication and avoid any misinterpretation. Support is available through chat and email only. That way, we are able to keep an accurate record of what exactly our customers need as against relying on telephonic conversations. Our customer success managers are available 24/7 to help you. Chat with us anytime of the night or day for immediate help. info@urgenthomeworkhelp.com Use this email id to mail us your assignments, get your queries clarified, get a quote. homeworkurgent@gmail.com Use this email id to mail us your assignments, get your queries clarified, get a quote. support@urgenthomeworkhelp.com For escalations, use this email id. homeworkurgent Leave a message for us on Google Hangouts. homeworkurgent@gmail.com Leave a message for us on Skype. GET A FREE QUOTE WITHIN MINUTES FROM A PROFESSIONAL ONLINE HOMEWORK WRITER. CLICK HERE. You can also chat with us on Google Hangout or Skype and tell us exactly what you need and when. Share any relevant documentation. Tell us if you would like us to follow any particular referencing style. Specify the word count. CLICK HERE FOR AN INSTANT, FREE QUOTE FROM A TOP ONLINE ASSIGNMENT EXPERT. ACE YOUR HOMEWORK & ASSIGNMENTS. We like to keep things simple and straight-forward. No complicated processes or extended wait times. No need to chase us for status updates - we will keep you updated with progress at every stage. No surprise delays or price-hikes. No putting up with rude and arrogant customer care executives. We are absolutely committed to delivering your completed assignments on time. If you are looking for urgent homework writing services for any of your college or university homework or assignments, we can help! Our online assignment experts can deliver any assignment, homework or project within 24 hours. Urgent deliveries go through the same amount of rigorous quality assurence testing as regular assignments. We always deliver high-quality work that will guarantee you best results. 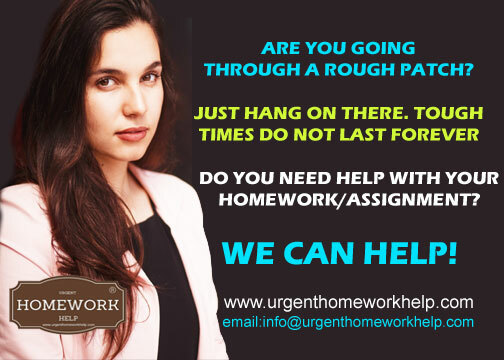 Urgenthomeworkhelp.com is best website providing college homework and assignment writing services and we work 24 hours a day so that our customers can easily reach us any time of the night or day, from any location. We also provide 24 hour homework help, meaning, if you are almost at the point of missing your homework or assignment submission deadline, and you have less than a day to go, you can ask us for 24 hour homework where we deliver your fully completed assignment within 24 hours. This is to make sure that no student will have to miss another homework submission deadline ever again. Chat with our customer success managers for more information. I had almost forgotten about my assignments. But, thanks to the UrgentHomeworkHelp.com, I was not only able to submit my assignment on time but also ended up among the top scorers in my class! Though, I must confess, I was a little sceptical about their "Overnight Assignment Help" concept but it was a good decision I had taken - to go ahead with them. I would definitely recommend their services to everyone! So glad I chose the urgent dissertation writing service from UrgentHomeworkHelp.com. Their Customer Care Rep listened to me carefully and made sure he had all the right information about what I wanted. Then I send in some reference documents and of course paid them. That was it! My completed assignment was delivered four days later without any hassle. Thank you, Team.